Before this month is over, I want to pay a final tribute to Nick’s grandmother who always said, “August is the beginning of winter.” (SLS reader Miguel from Coimbra tells me that in his native Portugal they also say primeiro de Agosto, primeiro de inverno -- “first of August, first of winter.”) Believe it or not, this is a full-color photograph that I snapped from my back door just after a winter snowstorm. If you live in New England, as I do, March is an excellent time to plan a vacation, preferably somewhere that is colorful and in full bloom. (I often visit my friends in the Southwest.) By the time March rolls around, everyone I know (even those irritating friends who claim they love winter, love snow) has pretty much had just about enough of icy, slushy, cold grey days. What may have seemed decorative back in December when the snow was novel and new, now is burdensome and a daily nuisance. (I wondered if this past year, as I no longer had to contend with commuting an hour each way to work, I would view things somewhat differently. I didn’t.) By early April, there is some hope in the slant of the sunlight, the slight warming, the quick melting of any lingering snowfall. But March, no. Eliot got it wrong. March is the cruelest month. By a long shot. Sausages? Candy? Both! Within the vast reaches of Istanbul’s Spice Bazaar just about anything is possible. Beaded and sequined bellydancer costumes hang next to heaping displays of ground peppers and herbs. Local cheeses follow mountains of henna and halvah (one of which is labeled “viagra” for alleged tourist amusement.) But here, fronting almond-stuffed apricots and dates and an assortment of hazelnut and pistachio delights, sits the mysterious Adana Sucuk. Linguistically confusing at first (Adana is a Turkish city famed for its spicy ground-meat kebabs; sucuk means sausage), the offering is actually a popular Turkish sweet. Walnuts (the variety shown here) or pistachios (used for Antep Sucuk) are sewn onto a length of string and then dipped repeatedly into boiled, thickened grape or mulberry juice. As the liquid adheres and solidifies, the treat comes to resemble its namesake sausage. It’s chewy, surprisingly not so sweet and is, as they say, an acquired taste. Still, Turks we know smile from within at the very mention of these “sweet sausages,” so evocative are they of a childhood spent before the onslaught of Western-manufactured brand-name candies from Nestlé. Vegetables. Sometimes I get so caught up in the meat and fish dishes regional to the places I’m visiting, I don’t get enough vegetables. Especially odd because I eat so many of them regularly at home. I remember the first time I went to Europe, I came home ravenous for green beans. And on a recent trip to Madrid, Jay and I decided to try a salad restaurant...a mistake we won’t repeat. On that same trip, we’d already eaten our way through the Asturian and Basque meat dishes on “our list” in Madrid, sampled the grilled octopus and other delights in Santiago de Compostela and made our first stop in Portugal. And along with our chanfana (wine-stewed goat) came a generous platter of Brussels sprouts, a godsend for these two vegetable lovers. Especially as they arrived mercifully unadorned, unlike many of the other vegetable dishes in Portugal. Salads don’t seem to be a strong point here in the land of memorable roast meats and chicken, grilled fish, stewed shellfish and fried everything. Don’t get me wrong. We love all of these things. A lot. But we do sometimes miss our greens. David Leavitt may favor Rose Macaulay. And countless others lean toward Jan Morris, Bruce Chatwin, Paul Theroux. But for me, the best travel writer is still Truman Capote. He observes, doesn’t miss a trick, and serves up with a gossipy delight the stories of the places and the people he visits. His collection The Dogs Bark. Public People and Private Places (containing several earlier books including Local Color) is a wonderful series of travel sketches such as this one here, his account of a 1950 train trip through Andalusia. (In the same volume, he also writes about Haiti, Hollywood, New Orleans, Ischia, Brooklyn, Tangier and elsewhere.) Eminently readable and engaging, the writing seems as intimate as a late-night phonecall from Truman the C, filled with details, insights, rambling asides. He lived in Taormina for awhile in a palazzo called Fontana Vecchia, and his tales of the townspeople (who thought he had the evil eye; his housekeeper refused to return) and of Lola (the pet crow he acquired and later brought with him to Rome) let you in on more about that cliffside Sicilian town than any guidebook from Frommer or Lonely Planet. The centerpiece of the book is his account of his winter 1956 trip to Russia (“the first of its kind ever attempted by an American theatrical group”) with the company of Porgy and Bess. Bureaucracy, official welcomes, citizens of Moscow, lack of privacy, the Cold War, the cold period...nothing escapes his delightfully evil eye. 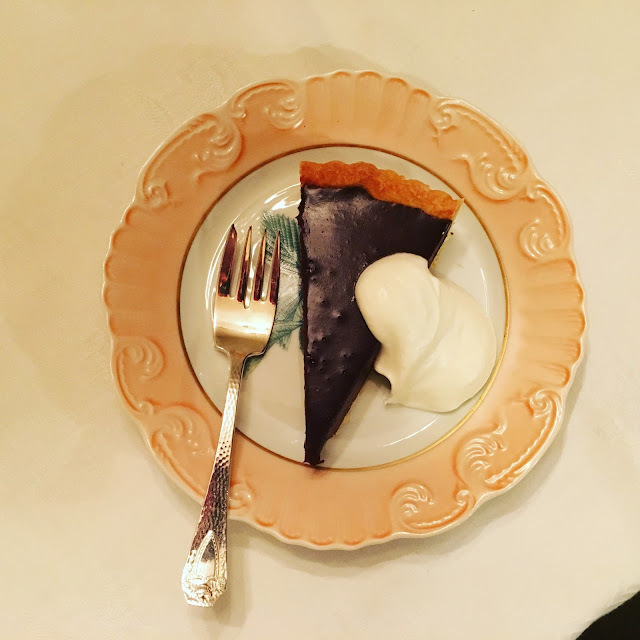 Because Birthday Boy Bill loves chocolate, Nick made this beautiful chocolate tarte for the dessert of his Thai dinner. As he was making it, he told me that the woman who gave him the recipe called it "the best chocolate tarte ever." And everyone who tasted it agreed with her. Thai? Well, there was some coconut flavor in the whipped cream. Flexibility. Not my strongest suit. Planning, prepping, making lists...my great strength. So you can imagine how I’d prepared for our Barcelona-to-Lisbon sailing, our first cruise, with stops along the way in Mallorca (where Jay had spent some of his childhood), coastal Andalusian ports, a brief stop in Portimao before arriving in Lisbon. I’d even booked flights and hotels to allow for a brief stay in each end city. And a good thing I did, too. Why? Twenty-four hours before leaving for the airport (almost on the dot), an email arrives from the cruise company. Mechanical failure. Change of ship. Cruise shifted a day later. Change in itinerary. No Mallorca. OK, what could I change? What was out of my hands? I scrambled online and found a cheap same-day round-trip flight from Barcelona to Mallorca during our “extra” day there and booked it. I was on the phone with the cruise company who offered a complimentary hotel stay (and meal vouchers) for the extra Barcelona night. I shortened the Lisbon hotel reservation. And then I tried to get some sleep. Unsuccessfully. But still, the new itinerary featured unexpected and welcome stops in Valencia, Cartagena and Tangier. "Go with the flow," they say. With some effort we did. Yes, that ceiling, that chapel. Jam-packed with tourists who seem progressively to disregard the “Silencio” notices posted about so that the guards frequently have to “ssshhhh” them in an amusingly systematic fashion. But there is a way to have this chapel all to yourself, if only for about five minutes. I can’t remember how I learned this, but it works. Be among the first on line when the Vatican Museums open (arrive 20-30 minutes before opening time, Mon-Sat 9am), and after you’ve paid your admission fee (you can book online; or save the 15 Euros and go on the free last Sunday of the month, 9am-12:30pm), race in the opposite direction from the signs pointing to the Cappella Sistina. (To be extra sure that this route still works, check museum maps online in advance or on paper as soon as you enter.) You’ll pass through some rooms of lesser Vatican treasures (sculpture, armor, etc. ), past Raphael’s magnificent School of Athens (you can go back later) and you’ll arrive at the fabled chapel through what most people use as their exit. Photography is (allegedly) no longer allowed. But if you time it properly, you’ll have several minutes there all to your silent self. Look up. One of the remarkable things I find in old European cities (that haven’t given in to complete modernism) is the large number of single-item shops. In Rome, behind the Pantheon, I found a store that only sells underwear for priests and nuns. In Madrid, a tiny outlet that offers lace fans, period. And Luvaria Ulisses, operating in Lisbon since 1925, where you can find hundreds of pairs of finely made gloves and nothing else. Guess what Conserveira de Lisboa, this tiny and well-stocked shop in Lisbon, has been selling for more than 80 years? Cigarettes? No. Playing cards? No. It sells only cans of preserved fish. Look at all the varieties. Tuna, of course. But also sardines (with curry or clove), mackerel, squid, mussels and more. I have to wonder how a charming store like this can remain afloat? How many cans do they have to sell each day in order to meet expenses? Oh, no, what am I thinking? Have I given in to complete modernism? Seen here, one of the many, many courses in the elaborate Thai dinner that Nick made for our friend Bill's birthday. 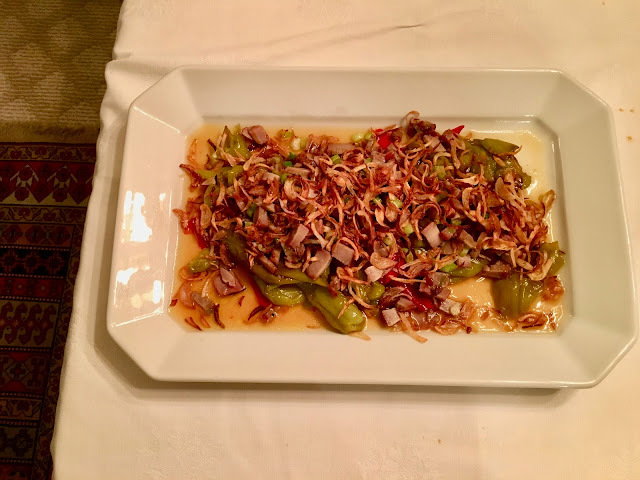 A green and red pepper salad with fried shallots and some other things in it. Nick warned the guests that the green peppers were mild but the red peppers were very hot and to be careful. One guest quietly asked, "Which are the red ones?" He then announced that he was color blind. When I told a friend recently that I was planning to go to a certain Barcelona restaurant that specialized in “molecular gastronomy,” he said, “Be sure to eat before you go.” I laughed, sort of, then remembered this meal enjoyed at a similar laboratory kitchen in northern Spain on an earlier trip. The place: Casa Marcelo, a relatively small and intimately lit room for which I’d had to make reservations well in advance. The menu was nine “courses” of small items like this one, called “Sardina en Lata” (canned sardine.) The food was beautiful and, warnings aside, satisfying in spite of a certain silliness. Huge plates with a teensy bullseye dollop of something, and often a title that took longer to read than it did to eat the serving. I remember feeling rewarded by a hearty tablespoon of a lamb-related confection toward the end, just before the “Piña Colada” appeared, the first of two desserts: pineapple sorbet topped by coconut cream that had been flash-frozen with liquid nitrogen moments before being tabled. The cost at this one-Michelin-starred restaurant, a well-worth-it 60 euros per person, plus drinks, tax, tip. I sometimes laugh when I see how companies force their “brands” into the names of venues or other sponsorship opportunities. I was working for Masterpiece Theatre when it became ExxonMobil Masterpiece Theatre, opening the floodgates for the rapid commercialization of public broadcasting. A recent “news” item announced that Smucker’s Stars on Ice was coming to the Verizon Center near Boston. Or was it the Bank of America Pavilion? Or the Tweeter Center, which became the Comcast Center? Oh, dear. On a much smaller scale, my beloved local library recently completed a major fundraising effort to pay for a dramatic rehaul and expansion of its main headquarters. One element: the chance to purchase bricks for the front entrance way, memorializing whomever or whatever you’d like. Within reason, of course. A low-rent version of the naming opportunities usually offered only to the bigwigs. Much more utilitarian and much more tasteful, here are some of the results. And all best wishes to Joel Hencken and Geoffrey Fine. No matter what part of the city I may have traveled to on any given day, it always seemed as if I were returning to the Hotel dei Portoghesi through this same small piazza and always between 5 and 6pm. At that time, the skies would darken with thousands of birds creating a loud cacophony of dissonant song. What set them off each day? (Was it me?) Look up. Though this photo hardly does justice to the phenomenon, I knew I must try to document it somehow. Googling to find the exact location on the map just now, I was unsuccessful. But not really, because instead there appeared the names of so many other memorable Roman moments nearby: Ristorante da Pietro (wild strawberry risotto, spinach gnocchi that we still call “little poems”), Via dei Prefetti (my beloved Pizzeria da Pasquale, home of potato pizza straordinaria), Via dell’Orso (L’Orso ’80 and its superb, endless assortment of antipasti that keep being brought to the table.) Ah, the Eternal Città. No wonder all roads lead to it. Every year for our friend Bill Grant's birthday, Nick makes an elaborate Thai dinner. I usually head to Brooklyn to help him prep. This year, I was part of the assembly line to put together these hors d'oeuvre. Vietnamese-style spring rolls (with shrimp, Thai basil, mint, a slice of scallion), pineapple discs topped with spiced ground pork and a slice of hot red chili (served in Chinese soup spoons) and spiced peanuts. And this was just the beginning. When I started househunting several years ago, I wanted a single-family home with off-street parking in a quiet neighborhood. Oh, and a little backyard. Just enough for a few tomato plants. Presenting my tiny summer garden, which I plant according to a different recipe or two each year. Here you can see tomatoes and more tomatoes. Also some pots of basil and parsley. What you can’t see are the green peppers (got nary a one this year from six plants) and the dill, mint and scallions. Just enough to make Itch (Middle Eastern grain salad) once I buy the bulghur. And some salmorejo (a cold gazpacho-like soup from Córdoba) when the tomato plants all start to produce at once. The cucumbers have pretty much come and gone by late August. The parsley is the last to go, usually right after Thanksgiving. And last year, my generous neighbor Alice and her husband gave me access to their super-abundant garden during their month’s vacation in Maine just as the tomatoes were coming into season. “Don’t let the tomatoes go to waste!” Thanks, Alice. Gazpacho and homemade tomato sauce forever! With some of my own basil and parsley thrown in for good measure. When I was working on The Captioned ABC News at public television in Boston, I was sent (along with my deaf friend Sandy T, left) to the National Association of the Deaf Convention to cover its centennial celebration, interview its organizers and phone in daily news reports. (I have no idea who this signing man in the natty three-piece suit is, but evidently he was important enough that the two of us needed to interview him.) Some of my memories of this trip to Cincinnati: walking across the bridge into Kentucky to watch the fireworks on July 4, making a beeline to Skyline Chili to try a three-way, attending a deaf disco in the convention hotel in which the bass was turned up so high I thought my fillings would fall out, attending a late-night party with my friend Eleanor in a room whose sliding door gave onto the hotel’s pool area (and, because we were so out-of-it, walking back through the wrong door into the bedroom of soundly sleeping strangers.) After almost a week of being at this non-speaking convention, imagine my surprise when I decided to take a walk early one morning and heard someone on the street say the first word I’d heard in days: maquillage. As I write this in August at my desk in Massachusetts, the Muslim world has recently finished honoring the holiest period of the year, Ramadan. This is the time that the faithful read daily from the Koran, fast from sunrise to sunset, are especially devout. And it’s also the time of iftar, the meal that nightly breaks the day’s fast and fortifies people to get them through the next stretch of daylight abstinence. Though the iftar may have had its humble beginnings as a few dates and some bread, it has in some circles become a lavish spread guaranteed to fill the eater for hours to come. Some restaurants expand their normal menus to include special dishes to mark the holy season. Others set up extra tables outside, sometimes under tents, to accommodate the Ramadan crowds. The meals often extend way past midnight, some almost until sunrise when the fast begins again. I wonder if these three waiters, who kindly agreed to be snapped at our farewell meal in Istanbul, have to deal with any especially spikey diners at the excellent Sofyali 9, people whose blood sugar may be low from hours of fasting, testing the limits of even the most gracious traditions of Middle Eastern hospitality. 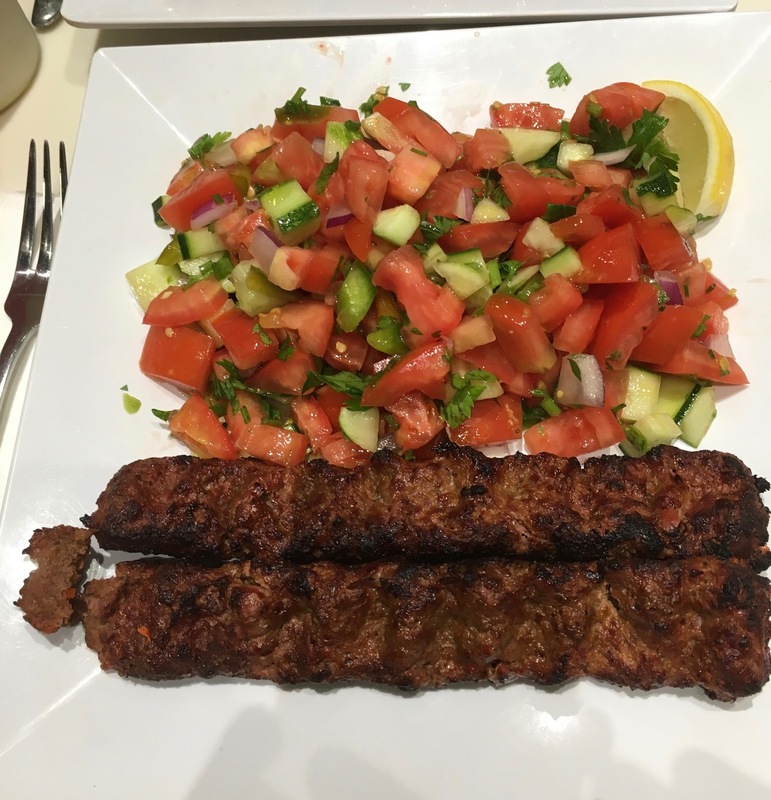 My terrific dinner on my most recent visit to Hazar Turkish Kabab: two skewers of Adana kabab and a double portion of çoban salad. No rice this time: dieting. No trip to visit my friend Nick in Brooklyn is complete without a visit to Hazar. At least one. Always on Christmas Eve. And even on this hot night when the air conditioning was not working at full capacity, the ceiling fans helped out. What's a little discomfort when I'm able to visit my favorite Turkish restaurant in town? Maybe even in the world. Why is autumn my favorite season? The colors? (Too easy an answer.) The schoolteacher in me? (The opposite should be true, no?) I think it may have to do with so many wonderful memories of things happening in this crisp, precise, no-nonsense season. When I was in high school and college, autumn would be the time that we’d go into Manhattan most often, making our student films, buying cheap sweaters, attending recent openings on and off Broadway, tracking museums and galleries. The extremes of summer and winter far off, the rains of spring forgotten. Most of the photos I have from those years were taken in the fall. There just seems to be more energy after summer’s laziness. Oh, and the colors, too, like those seen here in our front yard in Gloucester. My friends Donna and Emilia recently returned from Lisbon where they stayed in a small hotel over a bridal shop. Breakfast included. But they never had breakfast in their hotel, they told me, because each day they toddled on down to this wonderful cafe and bakery, the Casa Brasileira on the Rua Augusta, to try yet another of their seemingly endless assortment of confections. Look at those spikey, sugary things on the lower left up there. You can almost imagine how they’d collapse in a brittle surprise the minute you bit into them. I loved each of my own visits here, slowly learning the names of the pastries, many of them named for different saints, many solely named for their shapes or ingredients or both. Over on the right, can you pick out the “apple snails” and the “fruit rocks”? I grew up in New Jersey. When we went to the beach, there was no greenery nearby. No lawns, no plants, nothing. Just lots of sand and bungalows with pebbles in place of lawns. So when I came to Massachusetts and visited Cape Cod, I was amazed at having woods within sight of the beach. Lawns and gardens, even densely grassy dunes. But that was nothing compared to what I found in Ireland. Look at how lush this landscape is a stone’s throw from the sea’s edge. And so green, I couldn’t stop laughing. I always find it comic when things are as they’re portrayed in cartoons or clichés. When an owl says, “Who,” for example. Or when, as I found here, Ireland turns out to be really green, the Emerald Isle really emerald. I maintain a tradition whenever I visit Tucson. I must purchase something to take back to New England with me that is big, breakable and very difficult to pack. I usually have no problem identifying several items that qualify during each trip. For example, these stars, seen at the excellent Mexican restaurant, El Charro. I love them. And I couldn’t help myself from buying an excessively large one several years ago when Jay and I ventured just south of the border to Nogales, Mexico. So large in fact that we could not find a box to contain it for the trip home to the East Coast and had to cobble one together from several cartons on hand. Getting it on the plane was another story as it was too big to fall within the acceptable dimensions. And then transporting it from the Boston airport to my house, well, it was a challenge from start to finish. But now it hangs proudly on my front porch, a little out of place in the Boston suburbs, but a nice reminder of our Nogales visit. It sure would look perfect accompanied by a pair of similar stars like the illuminated lineup here at El Charro. Next time. 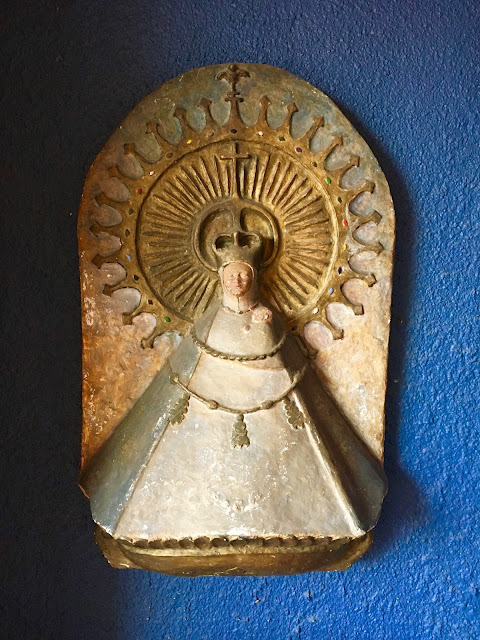 I was attending a meeting in a small neighborhood church in Tucson and this madonna was on a small altar just inside the front door. I liked that it appeared to be old, primitive and modern all at the same time. Recently, a new Turkish restaurant has opened not far from my home outside Boston. Called Istanbul’lu, its breakfast menu features an item poetically described as “A Plate of Turkish Mornings.” Mmmmm. How could you not order something that sounds so wonderful, so evocative? Early-morning running in Istanbul along the Sea of Marmara. Walking down the steep steps toward the Galata Bridge to buy some breakfast simit. Sitting at the wide-open cafe in Tunel Square on my first morning in the City of the World’s Desire. Or, to take a more literal route, this man, carrying his tray of baked goods through the Sahaflar Carsisi, a tiny, leaf-shaded square lined with used-book shops in a quiet neighborhood of Istanbul between the Grand Bazaar and the Beyazid Mosque. (It’s one of the oldest markets in the city, built on the same site as the ancient book and paper market of the Byzantines; since the 18th century it’s been a place where intellectuals have met and books have been sold. Still is.) Looks like he’s got plenty of açme, a flaky, egg-enriched pastry, as well as some other sweet items. He just strolled casually through the courtyard, stopping each time a customer wanted to buy something, and before long, to the delight of those around him, his plate of Turkish mornings was empty. I just can't keep away from Fonda. This time, a midsummer meal of guacamole made to order (muy picante tonight, served with hand-pressed tortillas, chips and pasilla de Oaxaca salsa), ensalada de sandia, taquitos de carne asada (marinated skirt steak with onions, cilantro and chile de arbol salsa), and, my entree, a wonderful pescado de guajillo -- a pan-seared filet of red snapper over guajillo-passion fruit sauce, served with potatoes, asparagus, roasted red peppers and red onion (apologies for the inexpert and somewhat ghoulishly misleading flash photograph of this terrific dish.) Excellent company (friends Nick, Robin, and chef/owner Roberto), a terrific space (packed with discriminating locals) and, as always, superior food. No wonder it’s one of my favorite restaurants in the world and I try never to visit New York without at least one dinner here. 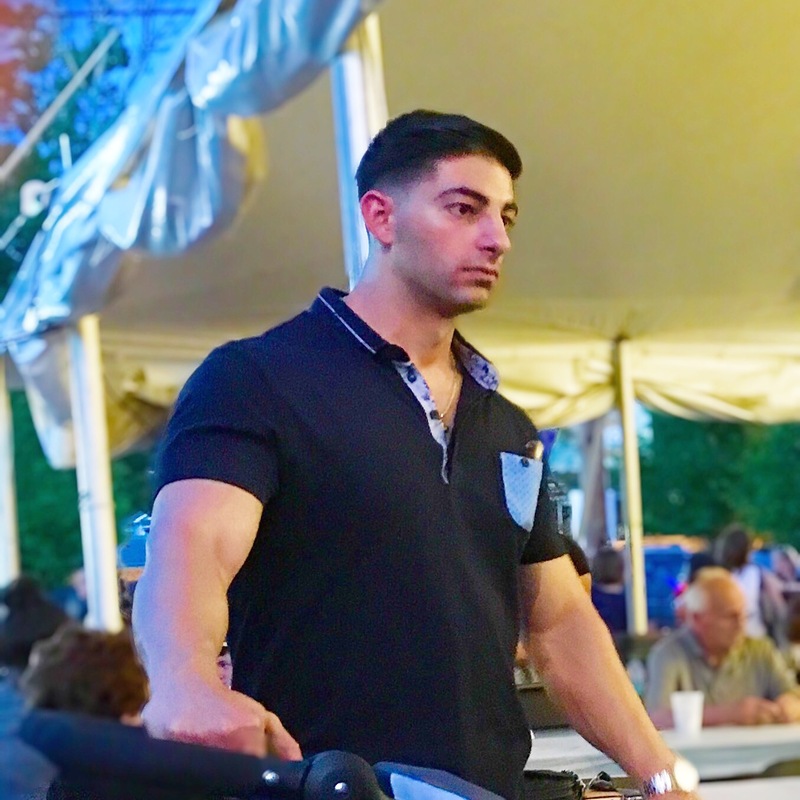 Another shot from my neighborhood's Greek festival. Yesterday's young man could not take his eyes off of me. Today's, alas, could. Who is this little boy and why would he not stop staring at me? With all the music, dancing and food on offer here at my neighborhood's Greek festival, this little one could not take his eyes off me. I attribute it to excellent taste on his part...or my big Ray-Ban glasses. In spite of his age (and his confinement to this stroller), doesn't he look like an old soul? Even more Mexican food! Here, some great tacos from recipes by el mejor chef mexicano Roberto Santibañez (of Fonda and Rosa Mexicano fame.) Roberto consults worldwide, offering his expertise in Mexican food of superior quality. Among the dishes he’s guided establishments in preparing: excellent tacos with an assortment of fillings (carnitas michoacan, chorizo con papas, pollo asado, pescado, camarón and more), all simply prepared from the freshest ingredients and laced with your choice of salsa (mild, medium, hot, very hot.) We recently had these tacos al pastor (adobo-marinated pork with onions, cilantro, pineapple and hot chipotle salsa. Mighty fine.) Roberto’s enviable knack is to take classics you think you may know, and then surprise you by showing how much better they can be when lovingly and skillfully prepared from only the best components. No skimping. No cutting corners. Sublime. "August is the beginning of winter," said my friend Nick's Italian grandmother. Maybe so in her Neapolitan hilltown, but not in the American Southwest. Seen here, the Café Poca Cosa, hands down, my favorite restaurant in Tucson. Simon and David brought me here for the first time many years ago when super-hospitable Suzana Davila was operating her upscale Mexican eatery out of its original Broadway location. Funky, colorful, loud, red. It was the first time I’d had Mexican food that wasn’t Tex-Mex, that was nuanced and sophisticated and un poco formal. I loved it. Now in its Pennington Street space, it’s a bit more stylish and chic, but just as wonderful and exciting. And, best of all, it still features the “Plato Poca Cosa,” which I have always ordered. Why? It’s the chef’s choice of three samplings from the evening’s entrees, allowing a tasting across the menu. Here, on a recent visit, I was served (clockwise from bottom) Carne Asada Adobo de Morita, Pollo Pipian Amarillo and Pastel de Elote Champiñones. 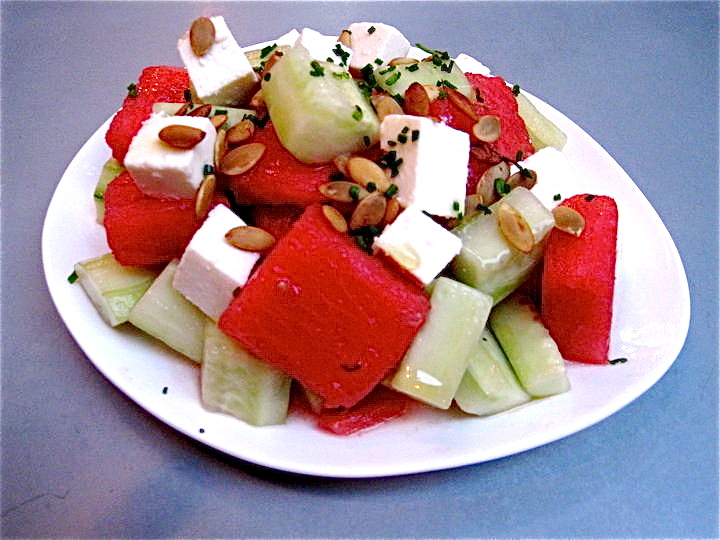 artfully separated by slices of vegetables and presented with their signature mountain of salad and fruit. A bowl of beans, a bowl of rice, a basket of tortillas. All this and the evening’s charming and delightful host, Norbert, to boot. Cielo.